With Mountain and Ocean Views! Experience the indoor/outdoor Hawaiin lifestyle! This one room cottage has a queen size bed, large covered lanai, outside private bath (shower separate from toilet and sink), outside kitchenette area, and an outdoor covered living area. Enjoy a quiet, country atmosphere with ocean and mountain views (Hualalai, Mauna Loa and Mauna Kea). On the dry side of Waimea at 1800 feet, days are warm and mostly sunny. It gets cooler in the evening and can also be quite breezy at times. 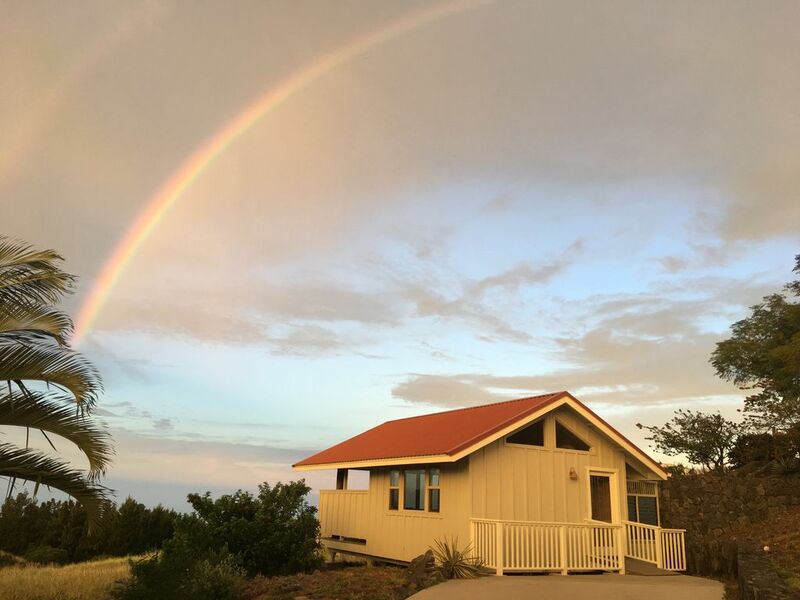 It is a perfect base for exploring the Big Island. Ten minutes to world class beaches and ten minutes to Waimea town, which has two grocery stores, dining, and shopping. It is also equidistant to the east and west sides of the island, allowing easy access to Volcano National Park. We are here to share where to go and what to do to make the most of your time in paradise! Hilary and Brian moved from Jackson Hole, WY to the Big Island of Hawaii in 2017. They are both avid travelers and have lived abroad. Brian began his love of far off lands in high school as an exchange student in rural Japan. After college back home in Missouri, he went to NYC for work, which not too long after took him abroad again for most of the next thirty years. He has called Toyko, Singapore, and Indonesia home, to name a few. Hilary was a bit of a late boomer making her first journey to another continent in 2007. After five austral seasons working in Antarctica, she was ready for another adventure and moved to Jakarta, Indonesia to teach Pilates. Their paths still did not cross until a chance meeting on the east end of Long Island in 2016. They immediately hit it off and now enjoy the Hawaii Lifestyle as home base for more travel together. Brian works in the tourism industry (no surprise there!) and loves to help people plan their adventures on this magical island. We love that this property is close to beaches and also high enough for cool breezes. It is the perfect launching point for both east and west sides of the island. The Ohana is a highlight of the property, allowing visitors to experience the wonderful opportunity for living in the outdoors year round, with all the comforts of a hotel room, and then some! The bathroom is outdoors. On one side is the shower and if you have not experienced an outdoor shower, you are in for a treat! The other side of the lava rock wall has a toilet and sink. It is covered but open. The toilet can get wet in a hard rain (dry side Waimea so not often) and we provide an old beach towel to keep it covered or to dry it off as needed. So far guests are loving looking at the ocean while brushing their teeth and seeing the stars from the loo. Views of Hualalai, Mauna Loa and Mauna Kea. Almost 180 degree ocean view. On a clear day can see to coastline to the south. Dedicated free parking directly in front of cabin. Bath, Hand, Wash and Beach towels provided. There are two yoga mats in the cabin. We have a covered (gazebo) outdoor living space with a sofa and chair. We have both a drip coffee maker and coffee; and a Nespresso with two pods. We have a spice rack available as well as some staple items like cooking oil and/or salad dressings. We have a full dish set and utensils for two and a wide selection of cooking utensils. The dining table is outside. It can be moved if needed due to weather. It is a large table with two captain's style chairs. The cabin has a large covered lanai (porch). There is also a large, covered yet outdoors, living room. We loved our stay! The pictures didn’t do it justice. The view was fantastic and we had everything we needed. The sunsets and the stars at night are amazing. Hilary kindly let us in early and was very accommodating. The outdoor kitchen and shower makes it so fun when you are in Hawaii. If we get the chance we will be back! Thank you Kristin! Lovely to meet you. So glad you enjoyed your time in our Ohana. I so appreciate you letting Brian pop in to take measurements while you were enjoying the sunset. We look forward to your next visit! We stayed at this lovely spot for a week. While everything is close, you will have peaceful quiet, gorgeous sunsets, songbirds and ocean breezes. The bed is comfortable and the terrace provides perfect stargazing and sunset views. The outdoor kitchenette, dining area, shower and powder room add a fun, twist to your stay. Beaches are just minutes away and cozy, cool Waimea is nearby for groceries and restaurants. Definitely recommend. Thank you, Brady! That is a wonderful write up. I am so glad you enjoyed your time and our cabin met your needs for a fun stay. I hope you can come back again! We had a truly wonderful experience staying in this beautiful cabin with ocean and mountain views. We are already looking forward to returning to stay at Hilary and Brian‘s lovely property. They are attentive and helpful hosts. The cozy cabin had everything we needed. It is a very quiet area and the views are lovely. Close to Waimea and excellent beaches. Clear stars at night. We spent over three weeks on this property and it began to feel like home. We will be back. Thank you! We (including Bo ; ) are looking forward to your return as well! I enjoyed our chats with you both. So glad our cozy cabin felt like a home away from home. We enjoyed our stay here. It was perfect and exactly what we were looking for with our stay on the north side of the island. Just a short drive to downtown Waimea for some great eats and a short drive to the coast for some awesome beaches. We enjoyed the outdoor shower. Hillary was an excellent host and made sure we had what we needed. If you do not enjoy the outdoors, beautiful sunsets, mountain views, and ocean views then this is not the place for you. Can't wait to get back! It was lovely to meet you both! Enjoyed getting to know you and share our beautiful spot with your adventurous spirit. Look forward to learning more secret spots to find next time.